The Quiet Man Bridge at Leam was constructed in the early 1840s, probably as part of the famine relief works of the time. It is a humped backed stone bridge with double Roman arches, and is known worldwide because of the John Wayne, Maureen O’Hara and Barry FitzGerald film The Quiet Man, directed by John Ford and filmed on location in this area in 1951. 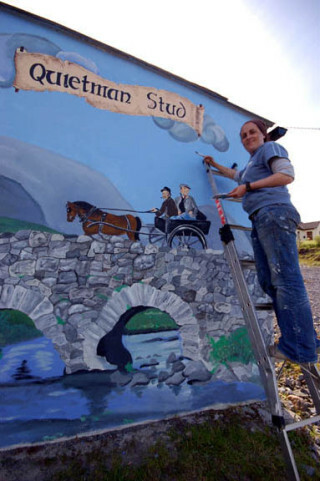 Mr John McQuinn, a local breeder of Connemara ponies and owner of The Quiet Man Stud, lives close to the bridge, and decided to celebrate it’s history by commissioning a mural by well known artist Catherine Cronin. Catherine started painting in her teens, and draws her inspiration from nature and flowers. She is also a specialist artist for a chain of pubs and restaurants in the UK . Her latest exhibition was held in Cork in November, and consisted of abstracts, bog oak, the human figure, portraits, rocking horses and flowers. Some of her most most recent work may be seen in Faherty’s Bar, on the Square in Oughterard. The mural of John Wayne being driven in a pony and trap by Barry FitzGerald over the Quiet Man Bridge has already attracted a lot of attention from visitors touring in the area, and is a tribute to the far-sighted public spirit of John McQuinn and his family at The Quiet Man Stud.